The 11 rooms of the Pullman Paris La Défense are adapted to suit your desires. Discover "Esplanade", a completely renovated lounge. This space bathed in daylight can accommodate up to 190 guests. Quinte & Sens offers fine cuisine in a sleek setting. Its menu attracts a clientele from all over the world: an invitation to flavors in the cosmopolitan area of La Défense. 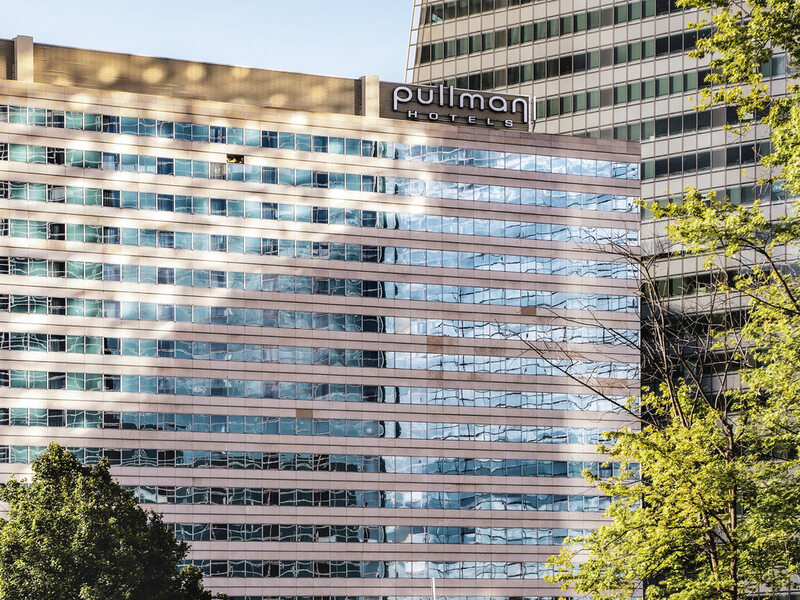 Last weekend we stayed at Pullman La Defense as we ran the marathon de Paris. Family and friends joined. We choose Pullman for a good night rest and amazing breakfast. Upon arrival hotel was very crowded due to casting for models. Only one room out of three was ready and needed to come back later. Upon return the extra bed wqs not yet placed in ghe right room. Staff and manager appoligized and offered us extra reward points. We enjoyed our stay very much with friendly staff, good rooms and wonderfull breakfast. Very much value for money. If we run Paris Marathon again next year, i already know where I am going to stay ... thank you Pullman and staff ! Nice expérience overall, but sauna was a disappointment. Very disappointed, the bed was horrible, sunken in the middle and kept seperating, no usb chargers and poor maid service. It was not a good experience. I would not return. The bed was horrible, it was sunken in the middle and kept separating. I expected one king bed not two pushed together. The electrical outlets would not function with the adapter, even the one provided by the hotel. There was no USB charging except off the back of the television. Maid service was terrible, when we left the maid was 3 rooms away, when we returned 5 hours later our room had still not been cleaned. There was no hair dryer in the room. The food was unacceptable for the prices that were paid for this stay. The coffee and water were not replenished. My stay at your hotel was great! The staff was most helpful. The chef was cooking up excellent egg dishes every morning and always got my order perfect. The food was great and service was fast at the bar. Overall, it was a wonderful experience. Good experience. Lea made it terrific. Lea at the front desk was extremely helpful and went out of her way to help me with a moto taxi. She got in the phone with the Marcel service to help confirm how it’ was going to work with my luggage and even took pictures for me so I could remember experience. Every time the stay is very warm - nothing is too much trouble for the staff who are so friendly. Ordered room service and they kept getting it wrong. touching my food etc. Also anything you asked for staff were like come and get it.. Really unhelpful and just a functional hotel. So after staying in the hotel for a few months and many attempts to fix it through regular feedbacks I decided to write the review here. This hotel is terribly managed and could deserve 3 stars max, just a few things to mention: - many rooms are in terrible condition - blocked sinks, not working air conditioning, poor renovation etc - we spotted mice in the restaurant a few times - staff in the restaurant area and in room service is poorly trained - huge queues to get seated for breakfast - the gym is a joke, whoever designed it must be hating sports -24 hour room service menu is not actually available after 23:00 These are just a few things, Im not mentioning lost items, empty minibar on check in etc The hotel is regularly fully booked as its the only hotel with the road access in La Defense area, so the management probably doesn’t care about maintaining it in the proper order. My advice - stay away unless absolutely necessary, cause the are is difficult for finding a decent accommodation. Hopefully, this feedback will raise awareness and trigger some long overdue actions. One of the best hotel I have ever used! Checking was okay; however, it was a bit off putting when you see three people at the checking desk and when I approached one, I was told to go to one of the other two. It is a small thing, but it stuck on my mind as odd. The person that checked me in was extremely lovely, very helpful and upgraded our room for free because we had a three year old. The stay was excellent; everything we needed in the room was pretty much provided and there was enough space in the minibar to store our own items. The slight downer is the minibar and breakfast are pricey, but this is expected of a 5-star hotel. However, there are enough amenities around the hotel to get cheaper breakfast and dinner; which is what we did. The hotel is conveniently placed around public transport and shopping areas La Defense has got to offer; 22mins to Gare du Nord. The hotel can be seen as dated for some or old style chic for others... In all, I enjoyed Pullman Hotel, and it was worth every bit I payed; in conclusion, a great experience!